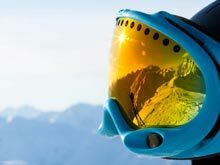 The Snow this season has been fantastic, the conditions are wonderful, the season is almost over, so it's time for all the instructors, resort workers and ski-bums to get out and enjoy the mountains. 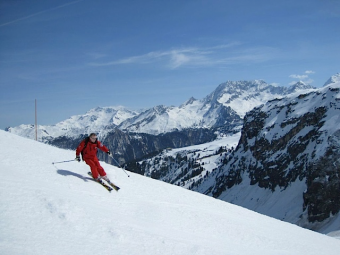 When i started skiing in Méribel some 22 years ago, if you needed someone to ski with, you just turned up at the central pylon in the Chaudanne at 10.30 and there'd always be someone you knew who'd be heading out. By 10.30 a hard-working chalet girl could have done breakfast, set the fire, cleaned down the bedrooms and made a cake for afternoon tea; so 10.30 was the perfect time. In those days there seemed to be legions of ski-bums in Méribel, most of them Aussie instructors who weren't qualified to work in France but migrated to the Alps and got by doing the odd bit of teaching English-speaking guests on the black. They rejoiced in nicknames like "Skip", "Bluey" and "Biggus" but they could ski and the rest of us learnt a lot from skiing with them. A lot has changed over the years: Méribel seems to have gone inexorably up-market, the Aussies have long departed but there are still quite a few ski-bums in town. A ski-bum i would define as someone who comes to spend the winter skiing but doesn't have a job. Today's ski-bums seem to be older (or maybe it's just that i know the older ones), a little bit better off than we were but still have that passion for improvement and a love for the mountain environment. 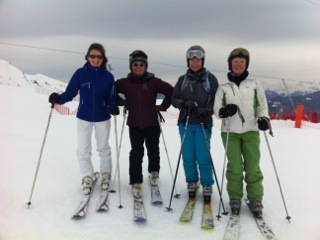 I've been reminded of my own ski-bum days this week as i've had more time to go skiing with friends. Since we got our new Saulire Express gondola this year, the old central pylon has been removed but strangely enough, everyone still meets where it formerly stood! Taking our inspiration from the phantom platform at St Pancras station from where the Hogwarts Express departs in the Harry Potter series, this area has been renamed "pylon nine and three-quarters." 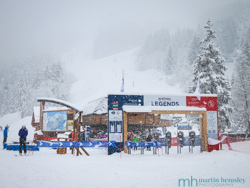 Each day this past week i've turned up at pylon nine and three-quarters to find an array of friends and ski instructor colleagues waiting to enjoy the mountain together and wind down to the end of season. 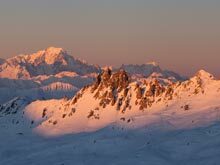 Plans for adventurous off-piste excursions have had to be shelved as the avalanche danger has soared to 4 out of 5 and we've witnessed some of the biggest slips any of us have ever seen. However, as the temperatures have soared during the day but the nights have still been cold, the "spring snow" has been extraordinarily good. For those of you who've never experienced this, it occurs when you get a succession of freeze/thaw conditions and then if you time it right in the morning and catch the frozen snow just as it begins to melt again, you could really believe you've gone to ski heaven as you glide effortlessly on what feels almost like icing sugar. 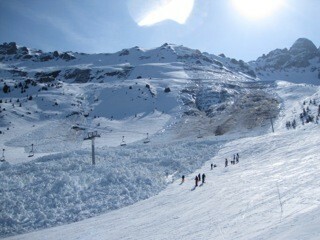 We've had the most unbelievably good spring snow all the way from the top of the Tougnete to the top of the St Martin bubble. 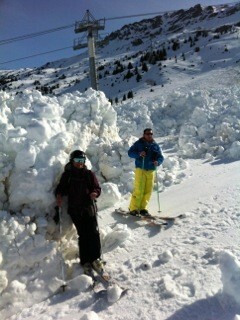 Also, this is really safe terrain, none of it approaching the 30 degree angle on which avalanches would occur. 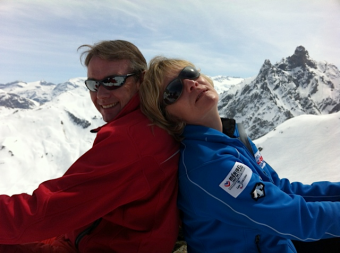 Apart from the great skiing, it has been wonderful to catch up with so many friends, many of whom i never get the time to ski with during the season. 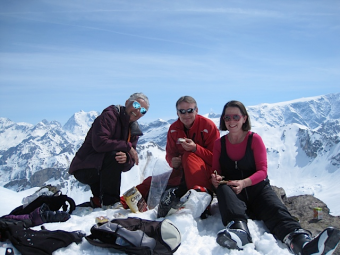 Of course good coffee stops and lunch have also been a feature of these past few days and we even managed to fit in a picnic at one of my old favourite spots; on top of the Rocher Grise chairlift, with a view into both the Méribel and Courchevel valleys. 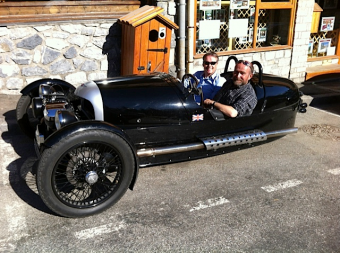 Yesterday i had a day off skiing and went for lunch in Annecy with my friend Rob Sewell in his brand new Morgan three-wheeler. Really, i had the most exhilarating ride of my life through what i think must be some of the most beautiful scenery on earth. Heads turned everywhere we went (for the car, not for us) as shoppers stopped to look, other motorists took pictures and people even applauded! A big YES for quirky British engineering! Martin has just reminded me to say.....As ever we would love to hear from you so please do leave a comment below, it's easy to do. Likewise feel free to follow us on Twitter and Facebook, you can click on the icons above.